The Authority Having Jurisdiction can be anyone from the local fire marshal to the building owner, but I'll address the most common one we encounter which is the local Fire Marshal. Following the minimum requirements of the AHJ is a key consideration for staying in compliance with local codes and staying out of trouble "with the law". AHJs can shut down your operation at the drop of a hat. However, most of the time (if you haven't' been completely negligent) the AHJ will give you 30 days to correct any problems that need to be addressed. √ TIP: Don't call your fire system service provider on Day 29 after receiving a citation and ask for service the next day. There might not be enough time to get the work done! In my opinion Insurance Requirements are a priority, especially in the world of industrial and manufacturing facilities. You want to be absolutely sure that you are following the standards of your insurance carrier so that you are covered in the event of loss or damage due to a fire and so that your policy remains intact. The Manufacturer's Recommendations are typically the most rigorous program for keeping your fire systems in optimum condition and operating exactly as they were designed. √ TIP: Many manufacturers will offer extended warranties on their equipment if you follow their service guidelines on newly installed systems. National Fire Protection Association (NFPA) is the foremost authority on installation and maintenance of fire systems and therefore the go-to guide for determining when and how to maintain your fire systems. √ TIP: Go to www.nfpa.org to find the NFPA codes pertaining to you fire system(s). State regulations are often consistent with NFPA standards and are a good starting point for determining maintenance on your systems. Just be sure you also take into consideration the NFPA code and the manufacturer's recommendations for your specific system. The type of fire hazard and the risk associated with having a fire should be taken into consideration when you are determining the maintenance program for your systems. More frequent inspections are commonplace on systems protecting higher risk hazards because it's increasingly important to make sure you have no gaps in your level of fire protection. 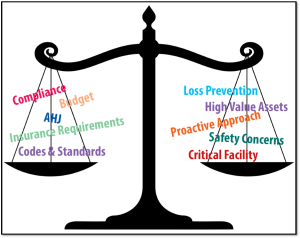 The value of your protected assets is paramount in determining the maintenance program for your fire systems. If your system is protecting mission critical equipment or high value assets you can never be too careful. The cost of downtime or the loss of irreplaceable items isn't worth saving a few bucks on fire system maintenance. You are better off safe than sorry in this case! Communicating your goals and budget for your fire protection program to your fire system contractor is vital. Your contractor cannot design a program to meet your budget or goals if he or she doesn’t know what they are. Because there are so many different factors that go into decided on a maintenance program that is right for you systems and facility, your service provider needs to know your goals in order weigh the factors and determine the best program to fit your specific needs. There are certainly additional factors, but these top the list. If I missed anything, feel free to provide a comment below. This post is contributed by Tiffany Konenkamp, the Service Operations Manager of the Alarm & Special Hazards Division at Century Fire Protection.